These foods grow right here where we live! You might have them in your own backyard! We collect leaves every day, but just can’t keep up! Take a look and see if you recognize the favorite leaves of these hungry animals. If you can collect some for us, especially on a regular basis, that is a great way to help the wildlife on their path to recovery! More details in the LEAF-let! That’s not all. Local businesses can put donation jars on their counters, or become corporate sponsors. 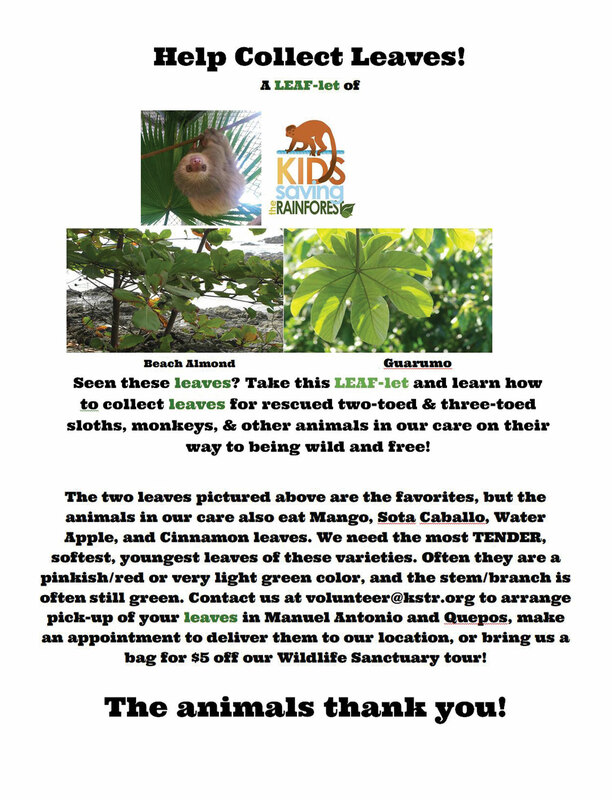 Schools can come visit our Sanctuary and learn all about the animals that live there and the hard work we are doing here to save Costa Rica’s wildlife. Hotels and rental houses can post our 11 reasons to not feed the monkeys (hand-out available upon request) and teach visitors coming through our beautiful area how to respect and appreciate wildlife while they are here. We are all so lucky to share this beautiful place in the world. Let’s all come together in this new year and do our part to protect this amazing place we live! If you’d like to send me a letter, I can be reached at spokeskid@kstr.org! Have a fantastic 2018 from Kids Saving the Rainforest!